L. Pyrenaica pyrenaica, Fr. chamois, Eng chamois, small goat-like antelope. It is not a beautiful animal but charming, sure footed and can reach startling speeds. 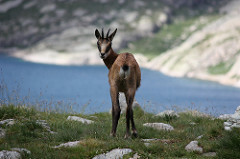 It is surmised that the chamois is a native of East Asia and that during the Ice Ages and Pleistocene different sub-species developed. The Pyrenean species lived in the mountains in northern Spain. Subspecies of the Rupicapra rupicapra or Alpine species are found in the Alps of Italy, Switzerland, France, Yugoslavia and Czechoslovakia. Their goat-like coats molt, being thick and dark during the winter and lighter and thinner during the summer. They weigh 30 kg more or less. Although they can live up to 20 years, their life expectancy is around 12 or 13 years. Like goats, they are fussy herbivores eating herbs, shoots, leaves, buds, flowers and pine needles. They prefer leaves and flowers, which they gobble up first, leaving pine needles for last, to pick over during the winter when nothing else is available. They are ruminants with stomachs divided into four parts to regurgitate their food and make sure it is properly chewed. As all parts of the animal were recycled in the Middle Ages, after its meat was consumed, a flute called the gemshorn was made with the antler. From 822, it was used as an instrument played at Hispano-Arab dinners in Cordoba as Zirab, the founder of the first Music Conservatory in Europe, introduced music to eaters. Shepherds used it as the rebecco for its gentle tones, which calmed their herds. Although not specified, it could be that the chamois horn was used to call all to dinner in castles for a horn could be used instead of a bell. See the Medieval Spanish Chef’s blog titled Corzo, published August 23, 2013 for Sent Sovi’s excellent recipe LXXXX, Sauce for stag or boar or for bears or roe deer or all wild beasts, p 123.